The DHCP service enables you to create DHCP subnets. Each subnet can have a number of dynamic and static IP ranges defined. 1. Go to Services > DHCP > DHCP server. 2. From the DHCP subnet panel, select Empty from the drop-down list. 3. Configure a meaningful name for the subnet in the Subnet name box. • Network — Enter the IP address that specifies the network ID of the subnet when combined with the network mask value entered in the Netmask field. For example: 192.168.10.0. • Netmask — Define the subnet range by entering a network mask, for example, 255.255.255.0. • Primary DNS — Enter the value that a requesting network host will receive for the primary DNS server it should use. • Secondary DNS — Optionally, enter the value that a requesting network host will receive for the secondary DNS server it should use. • Default gateway — Enter the value that a requesting network host will receive for the default gateway it should use. • Enabled — New DHCP subnets are enabled by default. Clear the selection to disable this subnet. • Primary WINS — Optionally, enter the value that a requesting network host will receive for the primary WINS server it should use. This is often not required on very small Microsoft Windows networks. • Secondary WINS — Optionally, enter the value that a requesting network host will receive for the secondary WINS server it should use. This is often not required on very small Microsoft Windows networks. • Primary NTP — Optionally, enter the IP address of the Network Time Protocol (NTP) server that the clients will use if they support this feature. Tip: Enter the Smoothwall’s IP address. Clients can use its time services if enabled — see Setting the System Time. • Secondary NTP — Optionally, enter the IP address of a secondary Network Time Protocol (NTP) server that the clients will use if they support this feature. • Default lease time (mins) — Enter the lease time in minutes assigned to network hosts that do not request a specific lease time. The default value is usually sufficient. • Max lease time (mins) — Enter the lease time limit in minutes to prevent network hosts requesting, and being granted, impractically long DHCP leases. The default value is usually sufficient. • TFTP server — Enter which Trivial File Transfer Protocol (TFTP) server workstations will use when booting from the network. • Network boot filename — Specify to the network booting client which file to download when booting off the above TFTP server. • Domain name suffix — Enter the domain name suffix that is appended to the requesting host's hostname. • Automatic proxy config URL — Specify a URL which clients will use for determining proxy settings. Note that it should reference an proxy auto-config (PAC) file and only some systems and web browsers support this feature. Note: For the DHCP server to be able to assign these settings to requesting hosts, further configuration is required. Dynamic ranges and static assignments must be added to the DHCP subnet so that the server knows which addresses it should allocated to the various network hosts. 1. Go to the Services > DHCP > DHCP server page. 2. From the DHCP Subnet drop-down list, select the subnet and click Select. 3. Edit the settings displayed in the Settings panel. For a detailed description of the available parameters, see Creating a DHCP Subnet. Dynamic ranges are used to provide the DHCP server with a pool of IP addresses in the DHCP subnet that it can dynamically allocate to requesting hosts. 2. Choose an existing DHCP subnet from the DHCP subnet drop-down list, and click Select. • Start address — Enter the start of an IP range over which the DHCP server should supply dynamic addresses from. This address range should not contain the IPs of other machines on your LAN with static IP assignments. • End address — Enter the end of an IP range over which the DHCP server should supply dynamic addresses to. For example, enter 192.168.10.15. • Comment — Configure an optional description of this dynamic range. • Enabled — Dynamic ranges are enabled by default. Clear the selection to disable this range. 4. Click Add dynamic range. The dynamic range is added to the Current dynamic ranges table. 3. From the Current dynamic ranges panel, Mark the relevant range. 4. Click Edit dynamic range. 5. Edit the settings displayed in the Add a new dynamic range panel. For a detailed description of the available parameters, see Adding a Dynamic DHCP Range. 4. Click Remove dynamic range. Static assignments are used to allocate fixed IP addresses to nominated hosts. This is done by referencing the unique MAC address of the requesting host’s network interface card. This is used to ensure that certain hosts are always leased the same IP address, as if they were configured with a static IP address. 2. 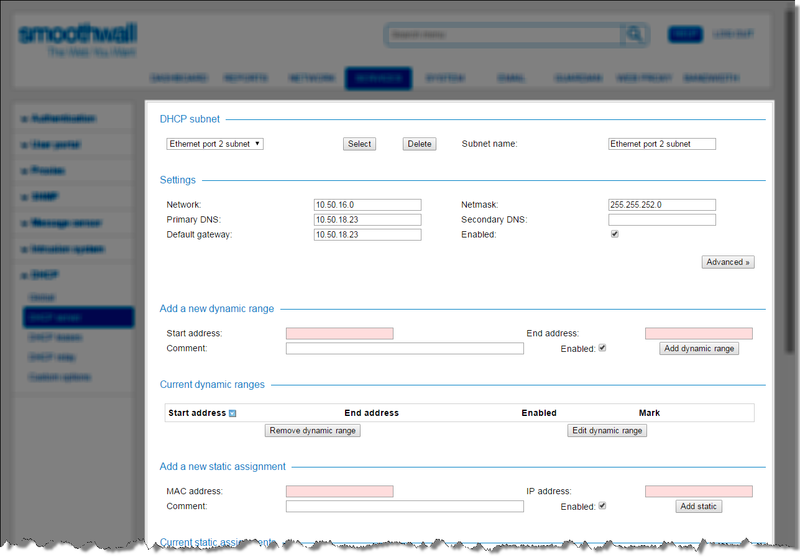 Choose an existing DHCP subnet profile from the DHCP subnet drop-down list, and click Select. • MAC address — Enter the MAC address of the network host’s NIC as reported by an appropriate network utility on the host system. This is entered as six pairs of hexadecimal numbers, with a space, colon or other separator character between each pair, for example, 12 34 56 78 9A BC or 12:34:56:78:9A:BC. • IP address — Enter the IP address that the host should be assigned. • Comment — Configure an optional description of this static assignment. • Enabled — Static assignments are enabled by default. Clear the selection to disable this assignment. 4. Click Add static. The static assignment is added to the Current static assignments table. 3. From the Current static assignments panel, Mark the relevant assignment. 5. Edit the settings displayed in the Add a new static assignment panel. For a detailed description of the available parameters, see Adding a Static DHCP Assignment. In addition to the manually adding static DHCP assignments (see Adding a Static DHCP Assignment), it is possible to add static assignments automatically from MAC addresses detected in the ARP table. 3. Scroll to Add a new static assignment from ARP table panel. 4. Select one or more MAC addresses from those listed and click Add static from ARP table.